Just pootling around on Sunday morning when the doorbell rang. It was our neighbour. Somewhat cautious, but a lot curious, I followed her next door and upstairs to the bedroom where her daughter lived until she moved out just a week ago. And there, in an open tank in the wardrobe, were two tiny balls of fluff. Very very tiny. 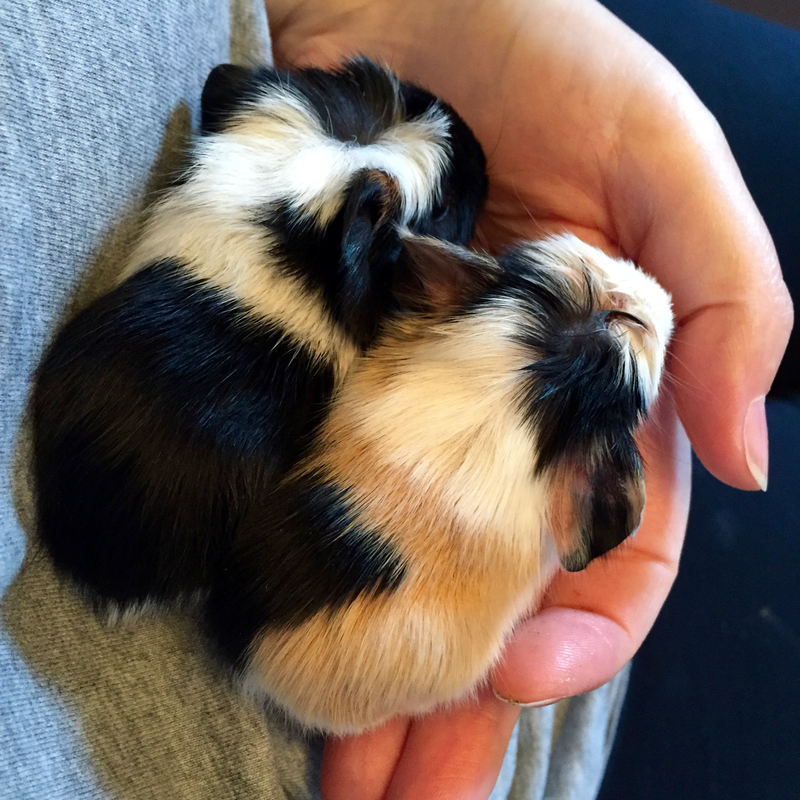 But unmistakably… guinea pigs. A quick look over revealed that one had a scratch on its head, but they were otherwise — physically at least — unharmed. My neighbour explained that she had heard squeaking at around five that morning and had gone downstairs to find her evil black cat playing with the first of them; she took it away from him, put it safe, and went back to bed. The cat, obviously annoyed, went out and came back two hours later with the second, which she also rescued. At some point there had been a third, though the cat must have tired of playing as the only evidence of that one was a lone leg. I don’t, or at least didn’t, know much about guinea pigs — they weren’t one of the creatures I considered when I originally researched what pets would be best for us to keep — but I did have a feeling that the milk and bread she’d given them wasn’t right — so I offered to take them, clean up the scratch and do a bit of research as to what they needed. I also put a lost and found notice up on Streetlife and tweeted about them, just in case someone knew someone who was short some baby guinea pigs. I had grossly overestimated their age, assuming that they were born pink, hairless and helpless like other rodents. Oh so wrong. So, rather than being a couple of weeks old, they were no more than a couple of days old. My neighbour made noises about taking them back, but knowing that she was about to go out for several hours and that she knew less than I did about their care, I said that I was happy to keep an eye on them. We got some goats milk and I begged a scoop of guinea pig nuggets from the local pet shop and with hand feeding every hour or two I managed to keep them alive. And they were still alive the following morning. Even better, the one with the scratch, who was unsurprisingly in shock yesterday, had perked up immensely and was eating well. The other one had decided to be distressed whenever I took the first out for feeding and demonstrated the guinea pig alarm call; it’s surprising how loud a sound can come from a tiny bundle of fur. After keeping rats who only ever squeak when they’re annoying each other, it was weird to have these creatures be so vocal. Social media had failed to find their owner so the chance of returning them to their mum was vanishingly small; we’d even tried knocking on a few doors in the area, but no joy. Now the important thing was to find someone who could look after them properly. Time was ticking. While I was prepared to look after them, we were going away for a wedding later that week and that was a deadline that could not be moved. Someone on Streetlife had suggested talking to a nurse at the local Blue Cross who keeps guinea pigs, but, it being a bank holiday, there was no answer. I had come across Furry Friends Animal Rescue some time ago, so I dropped them an email to see if they would be able to help. They said yes, but also gave me the name and number of a woman who runs a guinea pig rescue and is closer to me than they are. One quick phone call later and we had a home for them. We hopped on a train and, within an hour of phoning her, handed over the little fluffballs. It hasn’t been the best start in life for them, but at least they have a chance now with someone who knows what they’re doing.